© Birmingham Museums. Depiction of medieval Birmingham at the end of the 13th century, with St Martin’s Church sitting at the centre of the town. A recent talk I gave for the University of Birmingham’s People, Places and Things series of seminars prompted me to write this latest instalment about medieval Birmingham. In fact, it was a question from a member of the audience after I presented the video of Exploring Medieval Birmingham, 1300 (http://www.youtube.com/watch?v=JZq9cBzrIVI) that determined the topic of this blog. The person in question asked if I’d thought about superimposing images or footage of Birmingham’s present-day streets over the medieval depictions illustrated in the video. Nice idea, and yes, I did think of doing exactly that, but budgetary and time constraints prevented me from doing so, but that isn’t to say that this can’t be achieved in the near future. Nevertheless, until then this blog will attempt to fill a ‘void’ in going half way to doing just that. The 1296 Borough Rental referred to in my previous blogs on medieval Birmingham mentions around ten streets in the 13th-century town. Not a bad number, considering that Birmingham had roughly only thirty streets 400 years later. 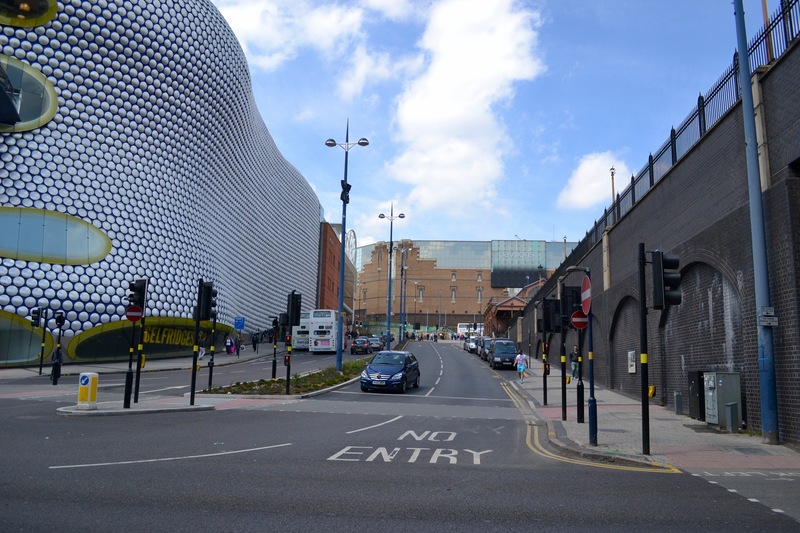 Moreover, some of Birmingham’s best-known streets today were already in existence by 1296. This included the likes of Egebastonstret (Edgbaston Street), le Parkestrete (Park Street), Overparkstret (now Moor Street) Novus Vicus (New Street) and Super Montem (the later High Street). One of the most recognisable streets in Birmingham with a medieval past. New Street isn’t as new as we might like to think, but certainly existed by the late 13th century. Perhaps it was only recently new then, but equally it could have been a fixture in the medieval town much before this point. While identifying the streets that framed the town, I started to think about their names especially as they can tell us a lot about an area and its ‘lost’ landscape. It’s easy to forget or simply not realise that the original meaning of street names, much like place names, once ‘said’ a lot about a location. The many different types of street name can reveal an abundance of information relating to topography or geographical location, natural features, types of industries or even people. It seems that the streets that shaped the medieval town of 1296 were largely ‘signposts’ of locational names or topographical features. One example is Super Montem, translating as ‘Upon the Hill’ and this isn’t hard to appreciate when you realise that this part of town really did and does sit at a higher level than the land leading downhill towards St Martin’s and Digbeth, suitably reflected by its current name, High Street. Then there are the convenient indicators of important trading routes such as Edgbaston Street, named after the Anglo-Saxon manor of Edgbaston, meaning Ecgbeald’s Farm. As Edgbaston was seemingly at one time more successful than Birmingham, as indicated by its higher valuation in Domesday Book, it’s perhaps natural that a road should lead to such a neighbouring settlement. After all, it’s very likely that Birmingham’s inhabitants were trading with Edgbaston’s and vice versa and not to forget that Edgbaston Street led to even more important locations like Northfield. Valued at £5 in Domesday, Northfield was one of the more prosperous manors in the wider area, worth five times as much as that of Birmingham. Moreover it was also once owned by the same overlord as Birmingham: William Fitz-Ansculf whose power was centred on Dudley Castle. 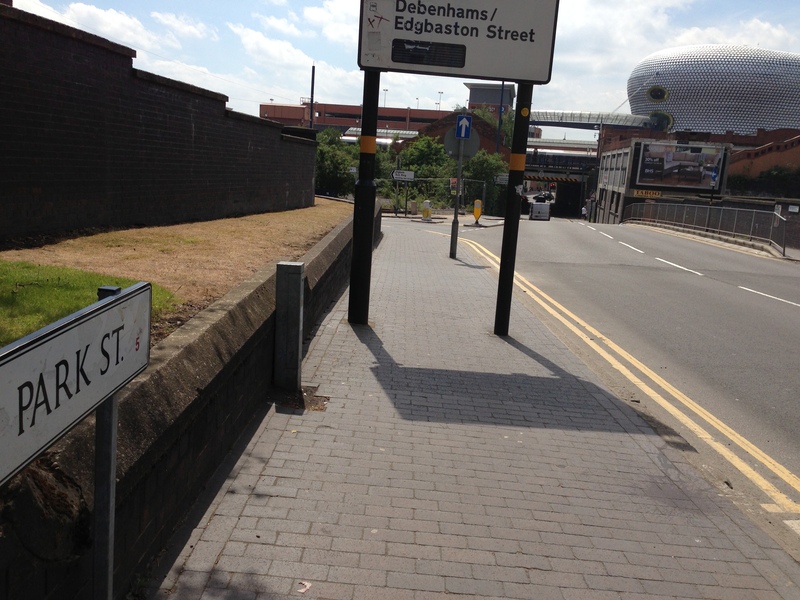 So perhaps the street also marked the importance of a wider trading route, as well as leading to Edgbaston itself. Another important manor also held by William Fitz-Ansculf was Aston, meaning the east estate. 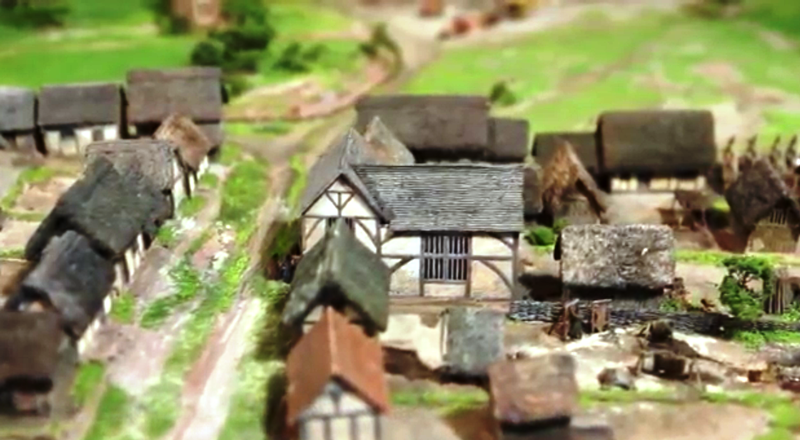 Its land and goods were valued at five times that of Birmingham’s at £5 in Domesday Book. Novus Vicus or New Street is an indicator of Birmingham’s growth and prosperity as new roads were being built presumably to accommodate more inhabitants and trading ventures. Perhaps also, the adjective ‘new’ reflects the age of some of the other streets in the town as they had presumably been in existence for some time to warrant the latest road being called new. New Street looking down towards what was once the heart of the medieval town. The name survives as a ‘relic’ of a pastime now long gone. Judging by the question that prompted this blog, people naturally want to know what Birmingham’s oldest streets look like today. 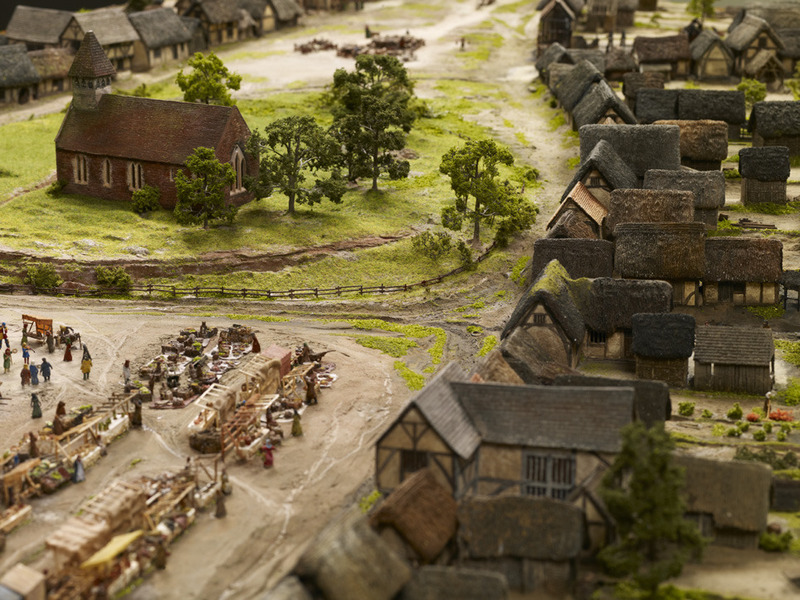 It comes as no surprise either that most reside in what is the oldest part of town; the original planned settlement Peter de Birmingham carved out in 1166. This is still one of the busiest parts of Birmingham today bustling with shoppers and inhabitants, now paying their ‘tolls’ and ‘rents’ to a different ‘lord of the manor’. 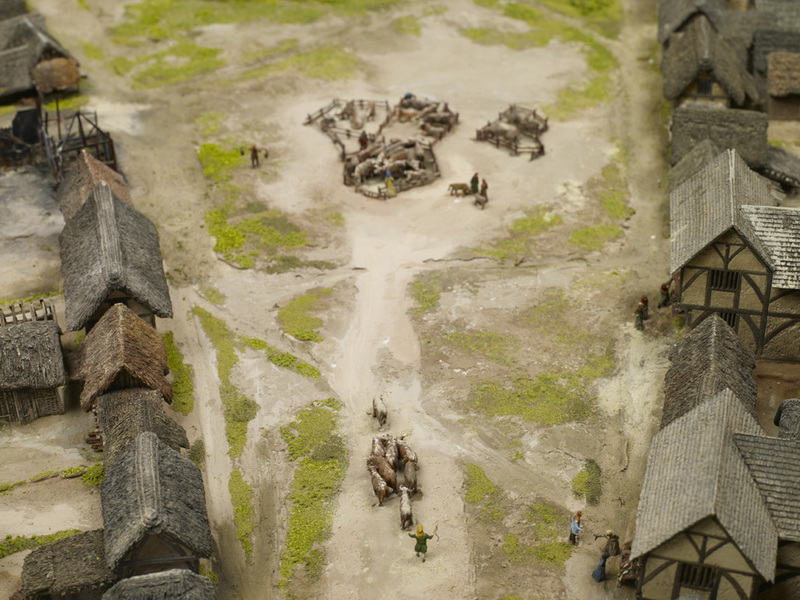 On account of the scale and size we had to adopt for the model of medieval Birmingham, the likes of New Street isn’t featured, so I’ve simply focussed on the streets that are depicted to illustrate what these medieval route ways look like today. 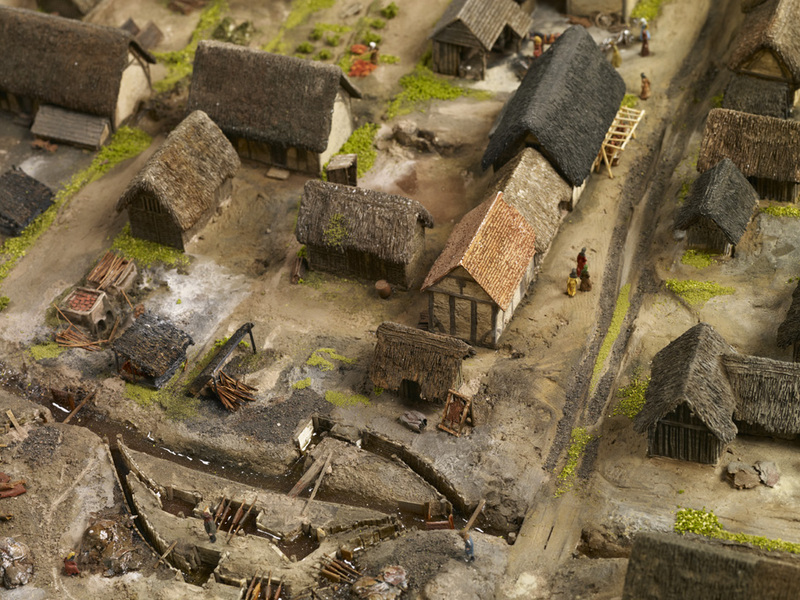 Taken from Birmingham: The Building of a City, the map depicts Birmingham in 1553, but the 12th-century town Peter founded can still be seen. 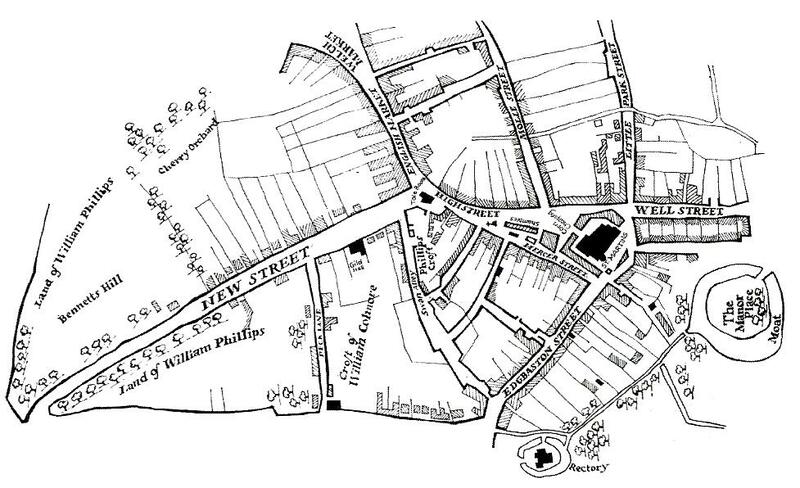 Notice the original triangular shape with four of Birmingham’s earliest roads branching from it: High Street, Edgbaston Street, Molle Street, soon to become Moor Street and Park Street, also at one stage known as Little Park Street. This brings me on to Edgbaston Street, which in the 13th century was home to surely the smelliest industry in town: leather tanning and judging by the archaeological excavations in the area this trade made the greatest mark upon the industrial endeavours of medieval Birmingham. As an essential material in the Middle Ages, leather goods were a staple of everyday life, as were other goods made from horn and bone, which inevitably grew out of the presence of the tanning trade. Today, Edgbaston Street has exchanged tanning for trading of a different sort, but you can still nevertheless find leather goods, minus the noxious smell, that is. 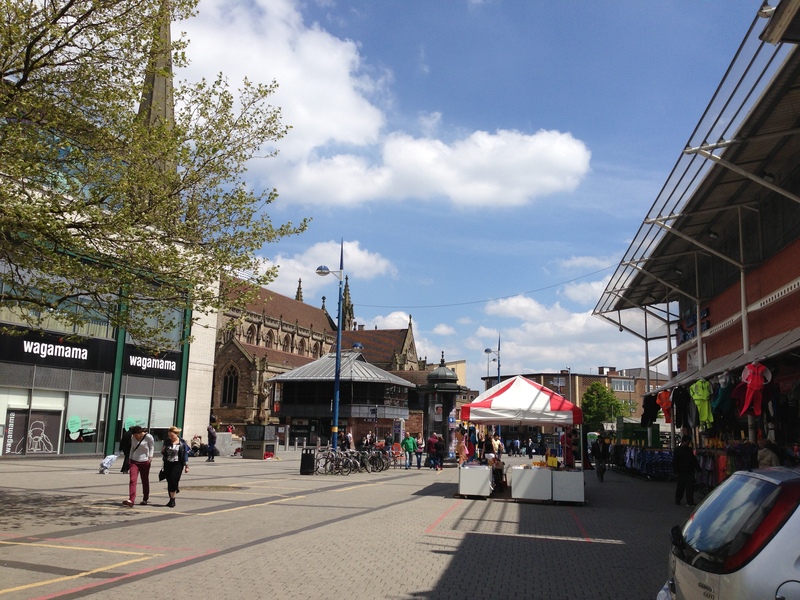 This street is now home to Birmingham’s famous Rag Market, amongst many other traders of mixed enterprise. 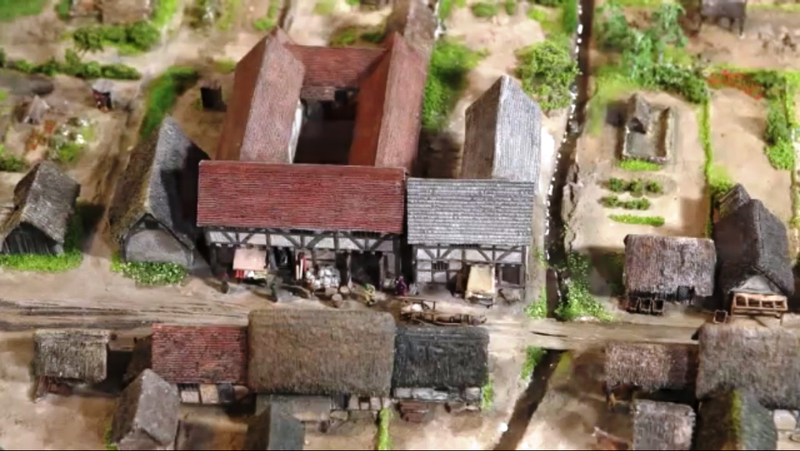 By 1553 the Tudor town had spread down New Street and towards the Priory lands of what is now Bull Street. © Birmingham Museums. Edgbaston Street in 1296 looking towards St Martin’s Church. Edgbaston Street today looking towards St Martin’s Church. © Birmingham Museums. The beginning of Park Street in the 13th-century town around where Selfridges is today. Park Street or le Parkestrete was developed to make way for the many burgeoning industries, thereby cutting into the lord’s deer park, on what was then the edge of town. 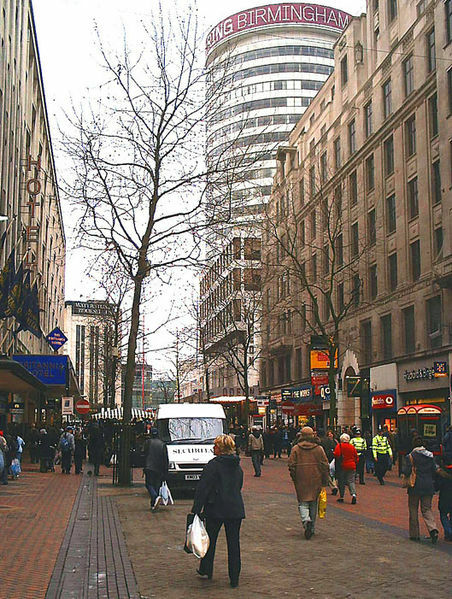 Although Park Street no longer lines the periphery of Birmingham, it does in many ways mark the edge of its shopping quarter lying adjacent to Selfridges and its attached car park. 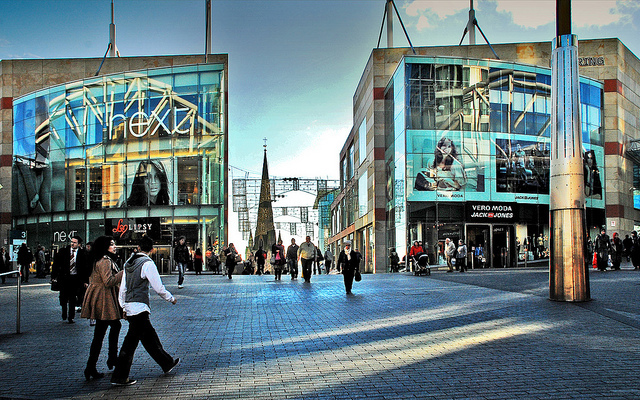 In this sense, Park Street is still on the fringe of Birmingham for many, particularly the enthusiastic shopper who merely walks this medieval road in pursuit of one of Birmingham’s biggest twenty-first century industries. The extent of Park Street today, which actually begins around Selfridges’ car park stretching to just past this point towards Millennium Point. © Birmingham Museums. The beginning of what was to become Moor Street near the eventual site of Selfridges. Much like Park Street, Overparkstret was also testament to the growth of Birmingham, with the lord once again sacrificing more of his own land for the good of the town, and of course his own pocket. The name is simple and reflects exactly where this new road would lie: ‘over the lord’s park’, or at least part of it. Maybe Overparkstret and Le Parkstret were cut at the same time, maybe they weren’t, but what is clear is that they came into existence to facilitate the expansion of some of Birmingham’s early industries like tanning and pottery making. 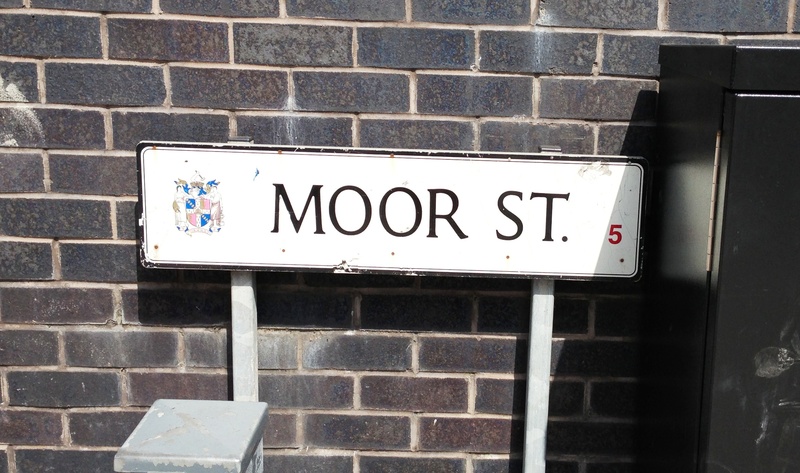 Junction of Park Street and Moor Street where we think Roger le Moul held just some of his numerous burgage plots in 1296. 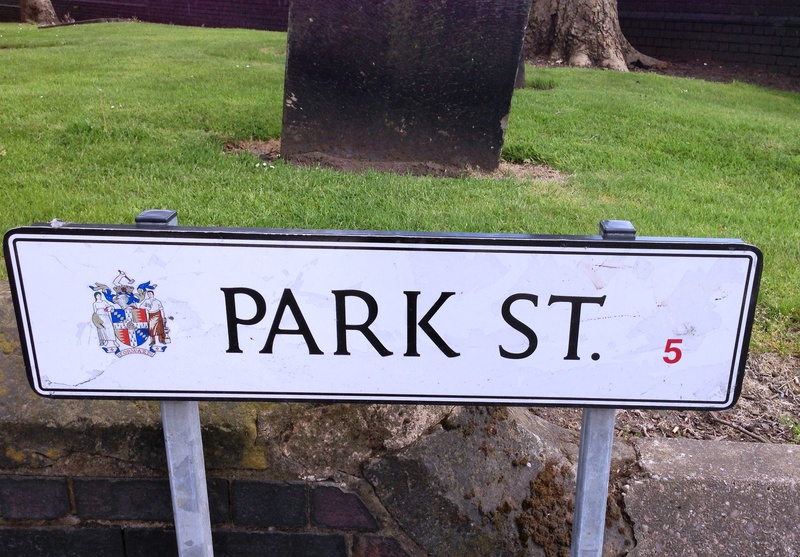 Perhaps the word park in two of the town’s roads which also lay very close to one another was slightly confusing for its inhabitants and traders, as Overparkstret was eventually renamed. In 1344 we find the earliest known reference to its new name: le Mulestret or Moulestret, in honour of the richest family in town, after the De Birminghams, at least. As we know, le Moulestret is today’s very own Moor Street, becoming the second of Birmingham’s medieval streets to accommodate a train station. We arguably have Roger le Moul to thank for this name change, and it’s indeed ironic that his surname translates as the small when we know he was a man of great property. Owning most of the land in town after William de Birmingham, he certainly ensured that his name and his family’s legacy would forever be preserved in his hometown. © Birmingham Museums. Start of Super Montem or High Street in 1296. This was no doubt used by drovers to bring their cattle to market in the town. Last but not least, we finish with Super Montem, now High Street, which is only just visible at the very edge of the scale model. True to its name it still sits on higher ground, which is why I always suggest that people make the effort to stand at the top of High Street and look downhill towards St Martin’s Church. Although the natural topography has been slightly distorted by the most recent Bull Ring developments, you can still get a ‘flavour’ of what the medieval landscape once looked like in terms of its gradient. Almost identical to the previous image in terms of position, High Street today is still bustling with shoppers and in the distance St Martin’s steeple peers up towards the higher ground. Street names are really an excellent starting point for beginning to understand the physical development and topography of places, and sometimes the most ordinary of names, just like Park Street, lying in the most unassuming parts of town, can with a bit of detective work, really reveal a ‘hidden’ or forgotten history of a place. These muted relics of the past can tell us much more than you’d ever imagine, acting as signposts to a displaced landscape or in some cases subtly pointing to a terrain still very much intact, but obscured by the urbanisation of the modern city. Nevertheless, if we take the time to look hard enough, we can develop these ‘negatives’ in to fully-fledged images and create a colourful depiction of these ‘lost’ landscapes.